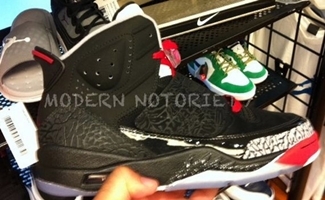 Jordan Brand is set to release a fusion and hybrid model in the form of the Jordan Son of Mars. Said to be inspired by the Jordan Spizike, the Jordan Son of Mars will be coming out in Black/Red-White colourway, which has lots of Elephant print throughout the shoe and has the mudguard of an Air Jordan 3 and a midsole and tongue of the Air Jordan 5. No official words for its release yet, but this will be coming out anytime soon so watch out for it! Air Jordan 11 Concord Creating Huge Buzz! Jordan 1 Flight to Take Off This November! A Look at the New Air Jordan 9! Another Jumpman H-Series Coming Out This May! Another Jordan TE 3 Low to be Released This Month!